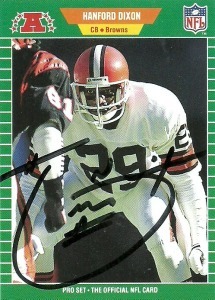 Hanford Dixon was a dominating defensive back who played his entire 9 season career with the Cleveland Browns from 1981-1989. A 3 time Pro Bowl pick, Hanford slid in at right cornerback and was later paired with Frank Minnefield after the USFL folded. One of the greatest physical man to man players of his generation, Dixon and Minnefield gave the Oilers wide receivers fits -barking all the way. Hanford was the originator of the ‘Dawg Pound’ name given to the Browns rowdy end zone fans. He thought that the Browns defenders were like dogs and the opposing offenses were cats they were chasing all day. Teams were aware of the ballhawking Dixon and threw the other direction. He intercepted 26 passes over his career with the Browns. In 1990, the Browns left Dixon unprotected via Plan B and signed respectable Patriot Raymond Clayborn to replace him. With the writing on the wall Hanford signed with the San Fransisco 49ers in 1990, but tore a quadriceps muscle during the preseason. He opted to retire. Dixon is immortalized as a member of the Browns in Nintendo’s Tecmo Bowl, where they shoved the star corner in at safety. They did get Hanford right however and made him one of the most dominant players in the game. Hanford continues to live in the Cleveland area where he’s a fan favorite. He did some coaching for the LFL Cleveland Crush, and also color and analyst work for gridiron and Arena football games in Ohio. Last year I took a few extra autographs I had sitting around and sent them out as gifts to friends who had helped me along the way TTM. Among them was Deadhorse, who located a few players I had been looking for. He quit sportscollectors.net cold and from what I could tell was out of the business. He went to an IP signing earlier this year in Ohio and got this extra card signed for me, sending it out of the blue.